Above are the print-screen from my Ipad showing my photo are currently used at Gloria Jean's Coffees Malaysia FB pages for promotion purposes. Perbadanan Nasional Berhad (PNS) are the master franchise for Gloria Jean's Coffees in Malaysia. My pictures will shown at Gloria Jean's Malaysia (GJC) FB page within 3 months start at 6th May 2013 (last Monday) until July 2013, Insyallah. 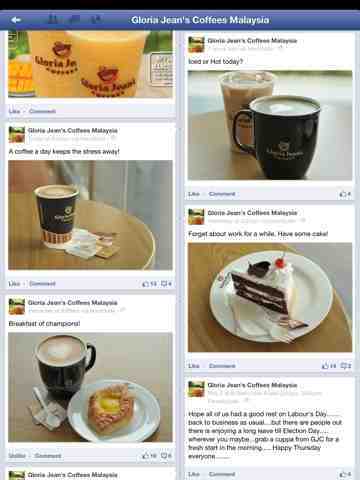 Lets LIKE my pictures at GJC FB page at http://www.facebook.com/GloriaJeansCoffeesMalaysia/ . Thank you for your support. Jom Ngopi!